She stands contained in the soul-making vessel of consciousness, but she has the strength to enlarge the container at any time. She's Nature's creature - her horns the symbol of that connection and of her power. They serve as antennae with which she, light-fingered, receives news from the Universe. She stands on the rock of her island and is surrounded by bare bones of wood washed up on its shores. She is in command of herself and her powers and reminds us to have courage to be ourselves. She is instinctual womanhood striding out of the ancient woods, holding her integrated masculinity which bears her news. She reminds us that being female is not her definition of womanhood. Ancient womanhood is related to the male as her internal partner and is wise in the ways of Nature, instinct and creativity. She brings this news of ancestral mother lines into the 21st Century and because she does so, wears the slipper of the heroine. Her feet are connected to the heart of the earth, and she is open to the winds of the world. It is her body and bone which know. She needs no head, the planet is her heart. A psychic state in dream time. The young male and female dressed in fresh seaweed and iris leaves are the internal masculine and feminine aspects of the larger figures. It is they who know about soul meeting, whereas the larger figures seem unaware of this internal knowing and walk away. Their leaves and weeds are course and withered and cannot be refreshed unless they look back and within. They stand reflected in a pool of consciousness, yet they are unreflecting. Their inner figures know, wait and reach for one another - a tension unresolved. 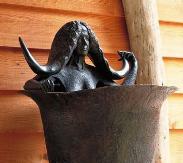 The mature fecund Goddess of Cycles lifts the antlers symbolic of Nature, holding them out for us to see. She cries out that Nature is in jeopardy, and it is the creative human spirit which calls to the rest of us to attend to the consequences of our actions. She asks us to consider our relation to our planet - asks the question of how our undisciplined reproduction can be sustained. Does our species have the right to crowd out all other species? The piece cries out NO! Nature will restore her own balance with or without us. She urges us to attune to her or lose. Will There be a Place for Me? The Goddess of the Cycles is reborn as Virgin. She is growth, anticipation and youthfulness about to spring from between the young horns of Nature itself, bringing her fruitfulness, a body filled with flowers out into the world. Has our consciousness made a place of welcome for her? She brings with her creative possibility and the answers to how to live in a meaningful relationship to Nature. She can teach us if we will ask the right questions and listen. Will there be a place for her? She is the Goddess of Nature's Cycles. She knows that death feeds life, that all food is a willing death giving life to all that needs nourishment. She gives herself back to nature as food for the others to come and is sheltered by the antlers of Nature while she rests. Her glowing bones are the indestructible life force, quietly waiting to be reborn into the Maiden Goddess who waits below her. And so it goes around and around, ​Life, then Death, then Life. The women who voluntarily journey into the inner labyrinth will discover and can release joyous instinctual masculinity. Willingly encountered by the female, the masculine no longer needs to hide in shame, but shines with his true power when joined with her. Together they are the spontaneous Dance of Life from which all creativity springs. The internally integrated masculine and feminine spirits in us all dance the world into being. 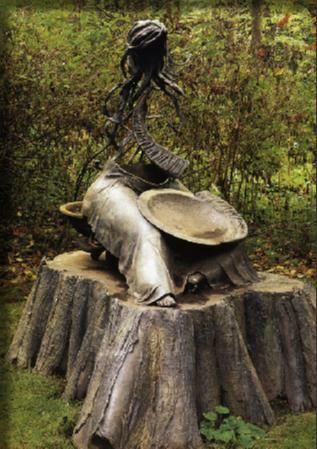 The Earth Mother as Oracle-in-the-2oth-Century guise is seated on the three-horned cauldron, home of the snake of feminine wisdom; she awaits us. The winds of our disbelief blow through her, but the horns of Nature hold her firm. Her dish of plenty upon her ample lap holds little now. The place where she sits has been cut, yet she will always remain. Have we the courage to ask her to prophesy our human future? Dare we do as she asks? Dare we not? Our psychic wholeness is the joining of the masculine and feminine. Being whole, we know it to be a gift, and joining our humanness with all the other natural forces, we offer our lives back to the Universe. We gift ourselves to the Universal Giver. Merlin, the archetype of the Seer, is joined with the tree, the feminine potency of the earth; a requisite for Kingship from Celtic times - the basis of our Merlin legend. 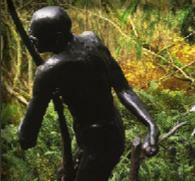 Supported by a staff of horns, symbolizing the spiraling cycles of Nature, he is wedded to the land. The Seer in our time is balanced between unconscious sleep and awakening. Will Merlin Wake? Will it be in time? The youthful Merlin is born from the Feminine. 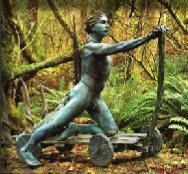 On his handmade cart he pulls his blanket of leaves, her talisman. The horns were once his crib, the other his tools for the future. He is a model of psychic wholeness in harmony With Nature. He is what we seek to become. 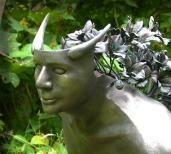 He clutches the horns which symbolize the spiraling cycles of Nature. As a commodity, he claims them as his. His abdomen is empty - insatiable. His hand wards off the Feminine whose clasped hands provide a seat for him. He desires to control Nature, scorning his rightful relationship with the feminine land. Wisdom is lost to him. She will await his return, dancing in the light. She stands grieving, reflected in the water of her tears. Her fingers have grown into Nature Herself, the green ferns of the woods now protect her. The fish fin pool contains her. Upon this reflection she stands strong In full acceptance of her sorrow, ​one of the many threads of all life. The backbone of the four-footed ones on which humans depend, encircled by our ancestors. The woman gives birth to agriculture. The hunter must shift. Will women still depend upon him? What will their relationship be? Humans, plants, animals. The backbone of the Universe. Skeletons of plant, animal and human, related by structure, related by need, ​mutually dependent upon one another for life itself. Have we the capacity to honor this need, to allow the plants and animals their own required realm which humans do not impinge upon? Or will we only consider human needs, invade their respective spaces, leaving only the skeletal remains of this vital trinity of dependence as a record of our folly? The stump has burned. From one side a living branch is growing. Life and death are joined. ​Within and protected, the figure rests. She is content. Within her the opposites are joined. Death's Sister is Life.